and the content of your website. The link text is is very important: It is the key for what you are running the optimization. It is the term with which you want to be found in the search engines, such as: "buy highspeed ram". This text will bring forward in the search engines when searching for "ram", "highspeed ram" and "buy highspeed ram"
The content of your website represents the 2nd critical point of the Search Engine Optimization: This page must fit to the link text, for which you want to optimize. The term "buy highspeed ram" must also be present on your page. Ideally, the term is in the URL, the page's title, as H1-day and several times in the text of the page. Ideally, your link text is directly related to the content (at least in part) of the link giving page. Links, or even lists of links that have nothing to do with the content of link giving page are worthless. Since it is nearly impossible to get links to your link pages which supports the text directly, with seoslave you have the opportunity to customize your content with your own short link text on the link giving page. For example: "With XYZ dealer you can buy quick ram. Now choose online." The text in front of and behind the link is a short of content directly related to your link. The link text "buy quick ram" is the key of your search engine optimization. This short content makes only sense if the link giving page is somehow related with the topic of your page. However, it is pointless to try to add a link to buy quick ram on a page that deals with "flowers". A common mistake in SEO is an incorrect link text. 1) Bad: "At Computer Shop XYZ you can buy quick ram. Now choose online." 2) Almost good: "At Computer Shop XYZ you can buy ram. Now choose online." 3) Good: "At Computer Shop XYZ you can buy quick ram. Now choose online." In the bad example (1) you optimize for 'Now choose online'. In practice, however, someone who wants to buy ram does not search for 'Now choose online'. In example 2 you optimize already in the right direction, but you will probably never get your site among the top 10 in search engines. Why? There are too many websites optimized for "ram"
Now for "buy quick ram" there are about 18,300,000 search results. At this point there must be noted that example 2) is the correct linktext in terms which do not deliver so many results. Granted, the selection of the right link texts is not easy. A good resource is your logfiles and your pages itself. First Consider some (not all) terms / items which are important for you. Consider with which keywords the user in the search engines would look for your articles / your site to find you. Look in the statistics of your log files for the keywords the user types in to find your page. Often there are similarities, so you can optimize with relatively little effort for technical terms. 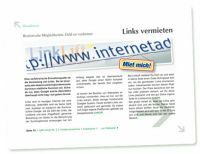 For a successful search engine optimization the variation of link text is very important. The background is simple: the modern search engine algorithms try to distinguish, whether it is a automatic link to a website or if the administrator has set the link his own/manual by free will. Automatic links are usually all the same. On the other hand links placed by people are very different from each other. Make sure, when you set link texts, to distinguish them, even if only slightly, from each other. "At Computer Shop XYZ you can buy quick ram. Now choose online." "At Computer Shop XYZ you can buy ram. Now choose online." "Here you can buy quick ram - XYZ Computer Shop. Now choose online." "Computer Shop XYZ: Here you can buy quick ram now online." "XYZ Computershop: You can buy quick ram. Order now." All these examples are slightly different from each other, but have the same meaning and serve the same purpose.